As we all noticed when frantically leafing through our diaries, Easter is late this year. And with its late arrival has come a very welcome heatwave. With this in mind, we’ve pulled together a guide for Easter with family-friendly activities and ideas that’ll make Easter go down sweeter than a Cadbury’s Cream Egg. See, good things do to come those wait. No Easter is complete without an egg hunt. Instead of the traditional, this year, introduce clues so kids have a bit of riddle-solving to do along the way. Or add challenges like ‘do 10 bunny hops’ for little ones to try. 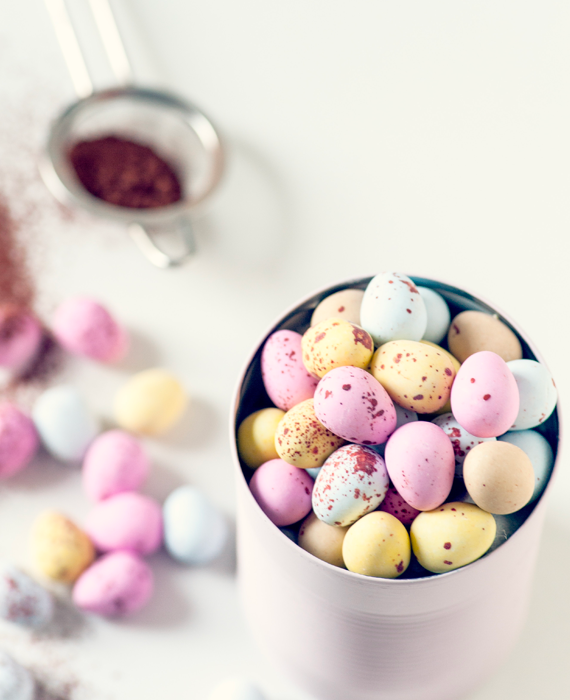 As an alternative, get the kids to hide eggs for the adults with rewards they’d like to receive – ‘extra pudding’, ‘stay up late’ and other requests will probably spring to mind. Why not host your own spring Olympics? Invite friends and family and set races such as an egg and spoon race, egg toss and a donut-eating contest of confectionary strung up on string. The garden offers ample spring-centric shenanigans. Grab some foil trays and encourage kids to make their own Easter garden. Pick spring flowers and press them to make a montage, or gather foliage to decorate Easter bonnets. Inside, try blowing out eggs and painting them. Think faces, farm animals (white pom poms for sheep, quail eggs for pigs) and botanical-themed eggs. Otherwise, dabble in a little Easter baking. Try making beautiful, edible Easter bark by melting milk and dark chocolate, spreading over a baking sheet and marbling together using a skewer. Scatter on some coloured chocolate buttons and chill in the fridge for an hour to set. Alternatively, host a mini Easter party. Play pin the tail on the bunny, Easter piñata or make some art by filling blown-out eggshells with paint and taking turns to throw at a canvas – messy but totally worth it. There’s a whole host of Easter goings-on to take part in this year. Join in with the Cadbury Easter Egg hunts at 260 National Trust properties (nationaltrust.org.uk), or look for dragon eggs at English Heritage sites (english-heritage.org.uk). At the Emirates Spinnaker Tower, Portsmouth, there’s an Easter trail running where little ones can hunt for egg-shaped puzzle pieces – plus there’s an Easter high tea for hungry grown-ups (spinnakertower.co.uk). Meet the Easter Bunny at Marwell Zoo, Hampshire (marwell.org.uk), and enjoy a Lindt Gold Bunny hunt at Hampton Court Palace (hrp.org.uk). An incredible 30,000 chocolate eggs are ready to be found at The BIG Sheep, Devon (thebigsheep.co.uk), along with a host of baby animals to admire. Budding scientists will be well entertained with activities at We The Curious, Bristol (wethecurious.org), featuring a 3D planetarium. Come up close to animated ice age creatures at Birmingham Botanical Gardens (birminghambotanicalgardens.org.uk), do some crafts at Pink Pig Farm, Lincolnshire (pinkpigfarm.co.uk), and help solve crimes to earn a CSI badge at The Deep, Yorkshire (thedeep.co.uk). In Wales, there are swashbuckling pirate theatre shows during various spring weekends at Folly Farm, Pembrokeshire (folly-farm.co.uk) and an Alice in Wonderland-themed tea party at Gower Heritage Centre (gowerheritagecentre.co.uk). Look out for The Very Hungry Caterpillar making his appearance at RHS Flower Show Cardiff (rhs.org.uk). Enjoy puppet shows at the Scottish Seabird Centre, East Lothian (seabird.org) and activities galore at the National Museum of Rural Life, East Kilbride (nms.ac.uk). Don’t miss the Edinburgh International Science Festival (sciencefestival.co.uk) where children can learn about everything from surgery to coding. Join in with activities throughout the town in Bangor’s Big Easter (visitardsandnorthdown.com), hop on the Easter Eggspress Steam Train, Belfast (steamtrainsireland.com), or book onto the Easter surfing camp at Alive Surf School, Portrush (alivesurfschool.com). We particularly like the sound of segways, zorbing and mini quad bikes at The Jungle’s Family Fun Day, County Londonderry (thejungleni.com). The perfect Easter holidays? We’ve just planned it.